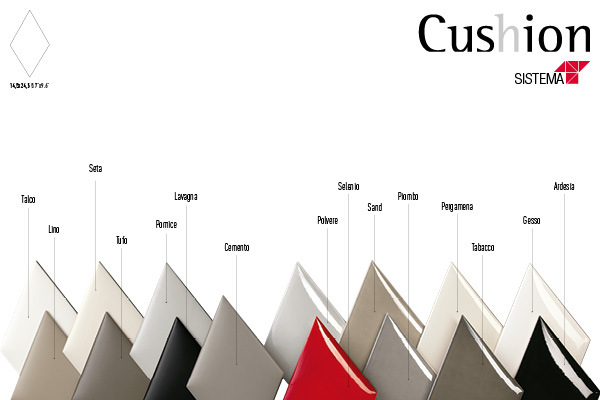 Rhombus-shaped camber covering in 8 glossy colours and 7 matte colours. Cushion is a three-dimensional covering. Thanks to its peculiar rhomboidal shape, it may be laid in a combination of ways, creating different patterns: a star-shaped or cube design, or creating the typical quilted effect. Its two surfaces, shiny (glossy) or opaque (matte) enhance the three-dimensional structure of the tiles and may be used in combination with one other with incredible results. The 7 colours of the matte version become 8 in its glossy version: they are part of the Tonalite T colour-system, ensuring chromatic correspondence between the different collections.